The Parade – Jenny and Jonathan Got Married! So tonight I went through the photos that I took in New Kensington in 2017. Most came from the parade on the weekend prior to July 4. This was the 2nd year in a row that New Kensington donned a parade on the holiday weekend. The 2016 parade celebrated our city’s 125th anniversary. The 2016 parade was the last of very many parades that I watched with my mother-in-law Fran. Fran loved parades. She loved watching her son and her son-in-law and many of our neighbors participate in the parade. Decades ago, she watched parades in New Kensington with her own parade-loving father. I’m happy that my last memories of Fran include watching a parade with her. My father-in-law Dennis tapes many of New Kensington’s parades so that my my three-year-old nephew A.J. can re-watch them later. Over and over. At home, A.J. lines up his toy fire trucks and police cars into tight rows for parades across the living room floor and the dinner table. I mention all this to explain my New Kensington family’s delight at the July 2017 parade. 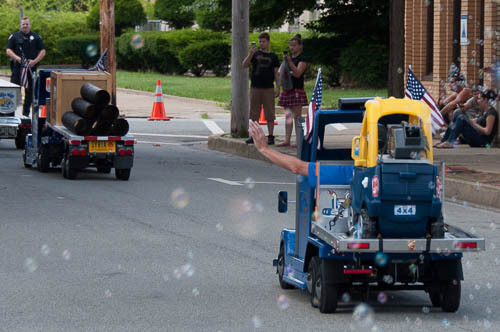 One of my favorite parts of this parade was the Shriners with their miniature trucks and their bubble machine. I zoomed into one of the bubble machine photos. The police officer standing guard in the background resembled all of the photos that I had seen of Officer Brian Shaw. I didn’t know Officer Shaw personally. However, New Kensington is my adopted home and last autumn Officer Shaw fell in the line of duty to this home. So, I wanted to share this parade photo because my memories of this parade are of joy and bubbles and also of belonging to this community. And it seems fitting that Officer Shaw stands in this memory.